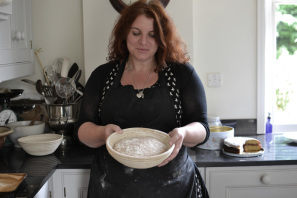 Basic Ingredients: Baker Vanessa Kimbell is a BBC radio broadcaster and author who specialises in baking with wild yeast. Those keen to learn about the pedigree of super trendy sourdough could simply refer to her website, a fascinating and insightful ode to the current king of breads and a runner-up in Looking to Cook’s Best Website award. However, this would mean missing out on a range of expert classes, held in Vanessa’s Victorian home in Pitsford, Northamptonshire. People travel from all over the world to take her informative, hands-on and fully immersive six-hour courses. They include Sourdough for Beginners, Learn to Make Sourdough Pizza and Set up a Home Bakery do exactly what they say on the loaf-tin. Completion of a class grants lifelong membership to The Sourdough Club, which supports continued learning through sharing tips, techniques, video tutorials and an annual Bread Exchange. Regular Sourdough Bread Clinics are run by guest tutors including baking supremo Dan Lepard and Vivien Lloyd, an expert on traditional preserves. They say: I set up the Sourdough club because I hated going on courses, feeling motivated for a few weeks and then finding my initial enthusiasm slip, so the idea behind the club is to stay in touch with students, set new challenges and encourage everyone to keep up their baking. It also means that students interact with other bakers and keep learning.